After the United Kingdom and France, perhaps the most promising rising force of the Reggae & Dub scene in the European world of vibes is Spain. One of the most talented new artists is without doubt Jennifer Paulos and it is really a pleasure to present her latest work on our netlabel. Born in Ponferrada, Spain, the Hispano-Swiss-Portuguese artist has started releasing her first works back in 2010 with Hide Side on “Corrupzion in Zion” (2010) and since then she is moving only forwards. 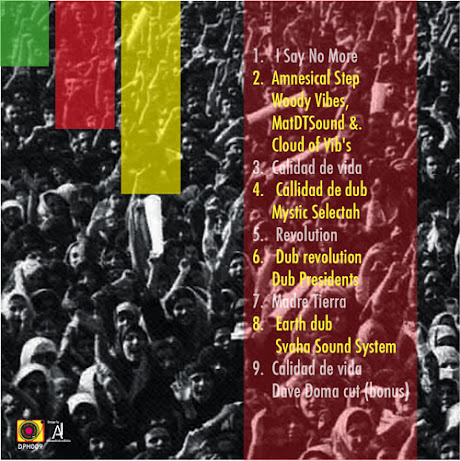 The collaborations with the local Spanish artist Dub Presidents, who produced her first album “The trial of the Self” (2010), as well as with Mystic Selectah (2012) from Madrid, were the starting point in her musical path. It was only a matter of time she would accomplish her international breakthrough through her collaborations with Izi Dub (FR) and Hi Fi Champion (CAN) in 2013. Her first work on Dubophonic is called “Revolution” and consists of nine tracks of pure consciousness, among them a version of a classic Tappa Zukie tune. Sang in Spanish and English, she uses her warm voice as a trademark of her Mediterranean oriented sound spreading to all listeners the funky vibes of her soul. Alongside with her you can find some exclusive dubs by the Dub Presidents (ES), Svaha Sound System (UK), Mat DT Sound (FR) / Woody Vibes (FR) / Cloud of Vib's (FR) & Mystic Selectah (SP), as well as a special bonus track by Dave Doma (ES). We say no more, just enjoy the vibes of Jennifer’s music and feel the consciousness of her lyrics.